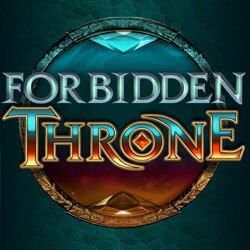 Forbidden Throne is an online slots game by developer Microgaming. In this online casino slots game, you will play as a duo of legendary warriors undertaking an epic journey to claim the eponymous Throne. As one would expect from a title by Microgaming, this online slots game is an absolute visual and auditory delight. Forbidden Throne also features a unique Wild Reels mechanic that will have up to 5 of your reels running completely Wild, leading to some truly spectacular stakes and winning combinations. The slots feature 5 reels, 3 rows and 40 pay lines, and has a wide betting range of £0.40 to £200. Forbidden Throne has a 5 reel, 3 row layout with 40 paylines for the player. You’ll journey with Wulthor the Elven Lord and Sorconass, the Queen of Ice. The attention to detail in the game’s art design is nothing short of astounding. Reel symbols are highly detailed, featuring a variety of fantasy-inspired items such as gems, weapons, spell books and magic amulets that represent the things that Wulthor and Sorcanass encounter on their adventure. The higher representations take the form of helmets and armour, with the lower values being represented by the various coloured gems. The Wild symbol is represented by the game’s logo itself. This functions to serve as a substitute for all other symbols (except for the Scatter), and will help players form winning combinations. The Wild Reels mechanic will see up to 5 Wild Reels appearing on each of your spins. Land 5, and you’ll find yourself with your staked up by 500 times. The Orb represents the Scatter Symbol in this online casino slots game. Upon landing 3 or more scatters, the Free Spins feature is triggered. If you land 3 or more Scatters, the Free Spins Round is featured. The number of Free Spins you receive directly correspond to the number of Scatters you land. Moreover, every free spin will also set up 5 of your reels running Wild! It is impossible to deny the allure of winning up to 500 times of your total stake through the Wild Reels. Between that, the Free Spins, and the arresting beauty of the game, Forbidden Throne is one online slots game that is not easily missed. Even if fantasy is not your exact cup of tea, Forbidden Throne is definitely an online slots game that is worth your attention.